James Flynn has defined "shorthand abstractions" (or "SHA's") as concepts drawn from science that have become part of the language and make people smarter by providing widely applicable templates ("market", "placebo", "random sample," "naturalistic fallacy," are a few of his examples). His idea is that the abstraction is available as a single cognitive chunk which can be used as an element in thinking and debate. The term 'scientific"is to be understood in a broad sense as the most reliable way of gaining knowledge about anything, whether it be the human spirit, the role of great people in history, or the structure of DNA. A "scientific concept" may come from philosophy, logic, economics, jurisprudence, or other analytic enterprises, as long as it is a rigorous conceptual tool that may be summed up succinctly (or "in a phrase") but has broad application to understanding the world. [Google translation:] As every year since 1998, the online magazine Edge (www.edge.org) has once again raised a great question to the best minds on the planet. And once again, this virtual forum of debate offers us all a wonderful opportunity to savor the thoughts of many top scientists and thinkers of the world. This year, the question posed by Edge was: "What scientific concept improve our cognitive tools?". I ask readers of Eureka to take away everything they can from the 164 replies received. They will find many pearls of wisdom in this ocean of knowledge. ...Edge has again shown that there is nothing like a asking a good question to the best brains. We all know the world of Professional Wrestling is low brow and can appeal to the lowest common denominator. Each time Wrasslin' gets brought up in discussing MMA I can almost hear Luke Thomas doing his best mocking yokel impression while chastising people for making continual connections between the two before feeling the need to inform us of his penchant for The Classics as his preferred means of recreational entertainment. Something like that. ...With that out of the way, here's the Science part. Edge Foundation, Inc. is a non-profit virtual think tank and claims its informal membership to include "some of the most interesting minds of the world" and has been featured and referenced by the likes of American Scientist, New Scientist, The BBC, The Times, The New York Times, The Boston Globe and Wired. Each year Edge poses a question in an attempt to get various thinkers from various backgrounds around the world to chime in with their own answers and interpretations. Questions have varied from philosophical ("What do you believe is true even though you cannot prove it?" 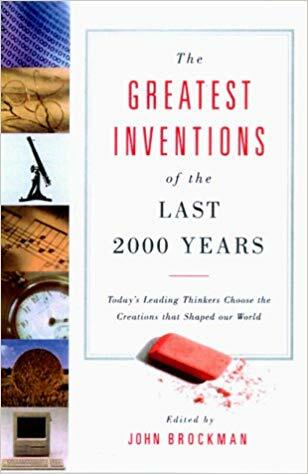 2005), technological ("What is the most important invention in the last two thousand years ... and why?" - 1999) and cultural ("How is the Internet changing the way you think?" - 2010). ...And as I alluded to, 'Kayfabe' formed the basis of one of the responses. [Google translation]..."Truth is only a model", writes Neil Gershenfeld, an MIT physicist. He finds that you should write down all the behind the ears, and lay people. In everyday life are shaped too much controversy about politics or lifestyle of the conviction to be right. Since one wishes for the humility of the researcher who knows he does not produce truth, but only models of reality that can quickly be back passé. "What scientific concept is in everyone's mental tool box? ", had asked the thinker Club Edge.org. As suggested before Gershenfeld skepticism about truth. The Italian physicist Carlo Rovell said even more pointedly that certainty was "useless, indeed dangerous." Uncertainty whether that will take us forward. What praise of the reflected half-knowledge! Human psychology can work against investors trying to make the best financial decisions, notes Nicholas Colas, chief market strategist at ConvergEx. 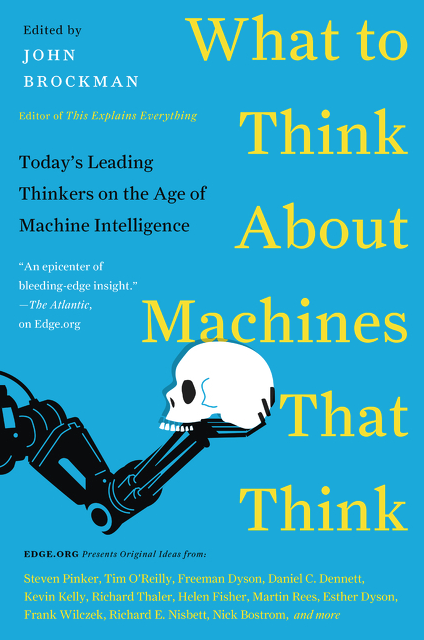 "Human nature, as it turns out, is a veritable minefield of biases and distortions that push rational thought through emotional screens to the point where clearheaded thinking can mutate into irrational outcomes." One of the most cited mantras of investing is to "think and think differently," the piece adds. Along those lines, Colas points to early investors who were insightful enough to put money into such companies as IBM (IBM) and Apple (AAPL) before they became giants of technology. He believes investors should ask themselves: What scientific concept would improve everyone's cognitive toolkit? Colas notes that's a question which has also been raised by the Edge Foundation, a think-tank run by John Brockman. Members of the foundation range from music producer Brian Eno to Nobel Prize winner Daniel Kahneman and Nicholas Taleb, author of the "The Black Swan." Robin McKie and Nell Boase are in the studio to discuss this year's Edge Question: What scientific concept would improve everybody's cognitive toolkit? The founder of edge.org John Brockman tells us how they dreamed up the idea of picking the brains of the world's leading thinkers, and one of the brains, social media expert Clay Shirky, explains his answer to this year's question. Each year, the Edge Foundation asks dozens of big-picture thinkers to answer a single question, in a short essay. This year’s question, proposed by the Harvard psychologist Steven Pinker, is: “What scientific concept would improve everybody’s cognitive toolkit?” Or, to paraphrase, how might people alter the way they interpret the information they take in about the world, to better comprehend it? A great question, as usual. But interestingly ambiguous: Who, exactly, is is the “everybody” in the phrase “everybody’s toolkit”? Every January the cognoscenti know to look out for the annual question posed by literary agent and self-styled intellectual impresario John Brockman on his Edge "salon" website. The trick, of course, is to get the question just right so that the great and good - and the wannabes - feel compelled to play what is often the smartest game in town. One of my favourites was the deceptively simple tease: "What do you believe is true even though you cannot prove it?" (2005), which provided diverse snapshots of individual intellectuals at work and of emerging trends. With this year's question, though, Brockman gets really tricksy: "What scientific concept would improve everyone's cognitive toolkit?" EDGE WORLD QUESTION 2011: "WHAT SCIENTIFIC CONCEPT WOULD IMPROVE EVERYBODY'S COGNITIVE TOOLKIT?" • My response to the EDGE 2011 Question is here ("Ambient Memory And The Myth Of Neutral Observation"). • Here is the index of all participants, more than 150 of them, including Brian Eno, J. Craig Venter, George Dyson, Kevin Kelly, Clay Shirky, Evgeny Morozov, Linda Stone, andRichard Dawkins (who will be returning soon as a Boing Boing guestblogger, I'm happy to report!). • News coverage so far includes: The Atlantic, Wired UK, New York Times,Sueddeutsche Zeitung , Newsweek, Die Welt, The Guardian , Publico. Paul Kedrosky has a wonderful piece for the deep-thinking site Edge.org about shifting baseline syndrome. It explains precisely why thinking that we're living in some anomalous "new normal" is a little silly. We're always living in a new normal, and the cognitive challenge is to remember that things haven't always been this way, nor will they remain this way. In 1995 fisheries scientist Daniel Pauly coined a phrase for this troubling ecological obliviousness -- he called it "shifting baseline syndrome". Here is how Pauly first described the syndrome: "Each generation of fisheries scientist accepts as baseline the stock situation that occurred at the beginning of their careers, and uses this to evaluate changes. When the next generation starts its career, the stocks have further declined, but it is the stocks at that time that serve as a new baseline. The result obviously is a gradual shift of the baseline, a gradual accommodation of the creeping disappearance of resource species..."
It is blindness, stupidity, intergeneration data obliviousness. 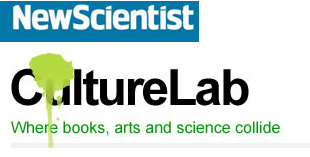 Most scientific disciplines have long timelines of data, but many ecological disciplines don't. We are forced to rely on second-hand and anecdotal information -- we don't have enough data to know what is normal, so we convince ourselves that this is normal. 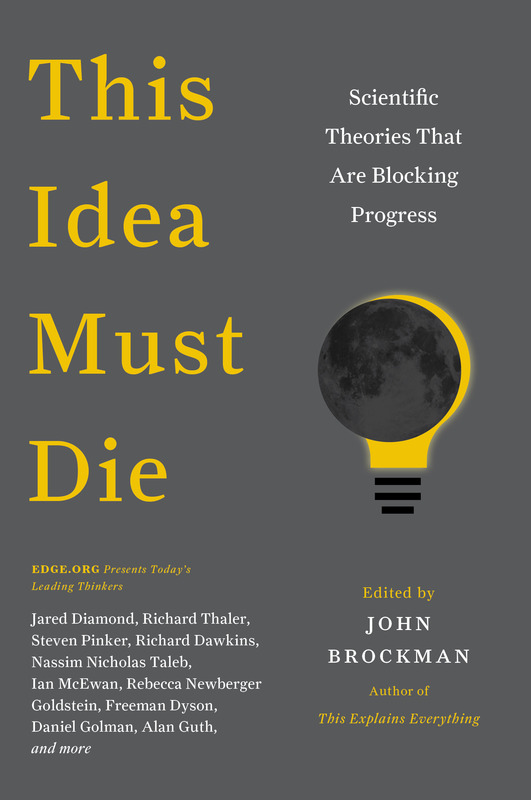 This year, Brockman asked: "What scientific concept would improve everybody's cognitive toolkit?" He took as his starting point James Flynn's notion of "shorthand abstractions" -- "concepts drawn from science that have become part of the language and make people smarter by providing widely applicable templates ('market', 'placebo', 'random sample', 'naturalistic fallacy', are a few of his examples)". If we have a shorthand linguistic means of expressing the notion, Flynn suggested, we can use it as an element in thinking and debate. "This is the most challenging question we've put forth to date," Brockman said. Daniel Kahneman, the father of behavioural economics, said: "It is my favourite question ever. You will get great responses and actually move the culture forward." 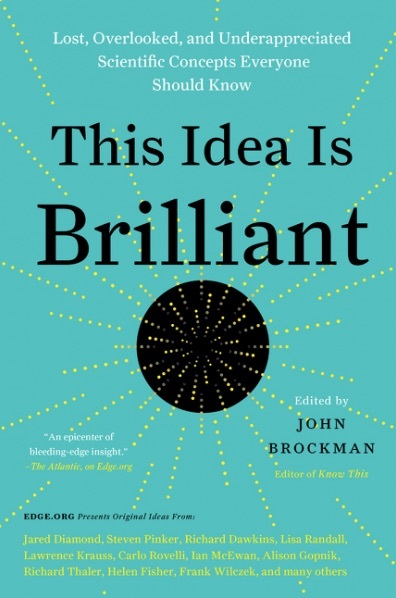 On Saturday Brockman published this year's submissions, more than 150 answers from the likes of Craig Venter, Brian Eno and Steven Pinker (mostly men, it has to be said, with contributors such as Alison Gopnik and Lisa Randall making up a small female minority). A number of Wired contributors have sent in answers this year, writers such as Jonah Lehrer, David Eagleman and Matt Ridley. Some journalists and editors were also invited to add their thoughts, which is how I submitted a proposal for "personal data mining" as part of the symposium. WHAT'S MISSING FROM OUR 'COGNITIVE TOOLKIT? In the meantime, there’s a rich discussion of aspects of this question on Edge.org, a forum for all manner of minds, curated by the agent and intellectual impressario John Brockman. Once or twice a year since 1998, Edge has tossed provocative questions to variegated batches of scientists, writers, artists and innovators. Some examples: How is the Internet changing the way you think? What have you changed your mind about? Why? What do you believe is true even though you cannot prove it? You can read my Edge contribution, centering on a concept I call anthropophilia, below, with links to relevant context added (the Edge format is straight text). Im Internetmagazin 'Edge' stellen sich Wissenschaftler und Intellektuelle der Frage des Jahres - was verbessert unsere Fähigkeit der Erkenntnis? On The Internet Magazine "Edge", Scientists And Intellectuals Are Presented With The Question Of The Year — What Improves Our Ability To Achieve Enlightenment? ... In the Anglo-Saxon culture things are different, and science certainly has continued in its global appeal. Thus, early English modern naturalism, founded by Humphry Davy, had a reputation not only for spectacular discoveries, they also for paying attention to public communication. The goal was the transfer of knowledge into the auditorium. This is clever, because science has, as much as any other movement since the French Revolution, changed the lives of everyone on the planet and it has by no means lost this position of leadership. On the contrary. Today when more and more people assume that the death penalty does not have a deterrent effect, it's not a new belief in a higher justice. Rather, it is the triumph of that thinking that the tools of rationality — language logic and statistics — are being used to make a statement that contradicts the common assumptions. It is, however, necessary to acquire language logic, statistics and other skills. Do not give a claim to power with a fath-based knowledge, but also mediate what knowledge is. This is not only an honorable task — it pplaces scientific researchers in the realm of medical doctors who take the Hippocratic oath. Knowledge is vital, and — this is the flip side — knwoledge can be abused: the great anti-human ideologies of the 20th Century were themselves scientific. The science community needs to communicate better. It's ever more delectable that the Edge Foundation— the network of prominent scientists and intellectuals founded by literary agent John Brockman in New York — has worked against the reciprocal ignorance of literary cultures and sciences of each other. Successfully. If you take the algorithms developed by Larry Page and Sergey Brin, which measure the value of links, Edge's website ranks seven on a global scale of ten. The New York Times ranks nine, eBay at eight. A group of thinkers explains how. “Never play cards with a man called Doc. Never eat at a place called Mom’s. Never sleep with a woman whose troubles are worse than your own.” That may have been fine advice for the 20th century, but to survive in 2011 and beyond we need to step it up—a lot. We need to, say, embrace the concepts that many mental illnesses are just extremes of personality traits, that humans tend to accept credit for their successes but not blame for their failures, and that “wholes have properties not present in the parts,” as sociologist Nicholas Christakis of Harvard University writes on the online salon Edge (edge.org). ... In a time when economic studies that scientifically "prove" that certain groups of people are smarter than others (Thilo Sarrazin keeps Muslim immigrants for less intelligent than German, while other studies show that leftists are smarter than right), like Conservatives and multicultural friends feel encouraged by Matt Ridley's statement that the individual intelligence or the intelligence of sub-groups for the welfare of a society are relatively unimportant. The decisive point is the "collective intelligence", says Ridley, which is not simply the sum of the individual intelligence quotient, but a function of networking, of labor and openness of a society. Adam Smith and Karl Popper already knew this. Too bad that we do not inhabit the parallel universe in which they live. Being comfortable with uncertainty, knowing the limits of what science can tell us, and understanding the worth of failure are all valuable tools that would improve people's lives, according to some of the world's leading thinkers. The ideas were submitted as part of an annual exercise by the web magazine Edge, which invites scientists, philosophers and artists to opine on a major question of the moment. 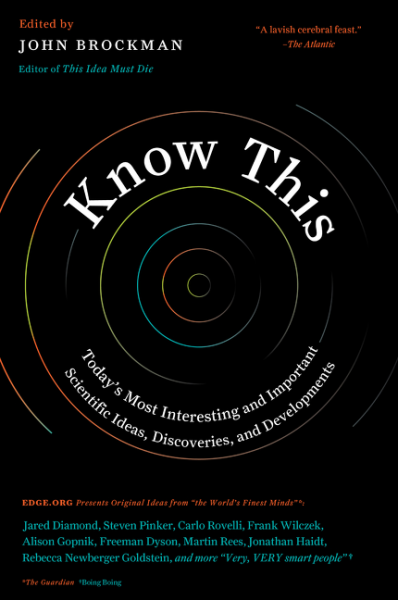 This year it was, "What scientific concept would improve everybody's cognitive toolkit?" The magazine called for "shorthand abstractions" – a way of encapsulating an idea or scientific concept into a short description that could be used as a component of bigger questions. The responses were published online today. Qual será o conceito científico que, se toda a gente o dominasse, poderia representar um salto imenso na capacidade que as pessoas têm de perceber e participar activamente nos assuntos do mundo? This is, in essence, the question that John Brockman, the American literary agent and director of the site edge.org, presented in late December to a constellation of world famous scientists. The results were published online this morning. The question was formulated more precisely as follows: "What Scientific Concept Would Improve Everybody's Cognitive Toolkit?" Since this question is not as direct and explicit as some of its predecessors (the question last year, for example, was "How the Internet is changing the way we think?") Edge is quick to contextualize it. 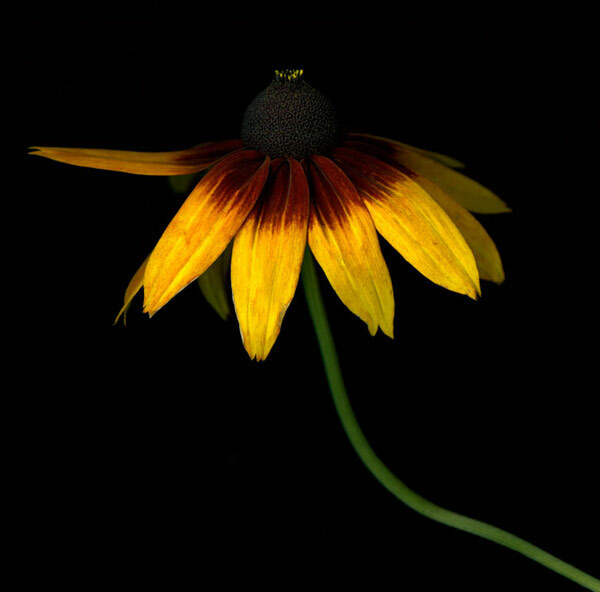 The point is that, according to James Flynn, an expert on human intelligence from the University of Otago, New Zealand, there are words and short phrases — such as "market", "natural selection", etc.. — Which constitute "conceptual abbreviations" (shorthand abstractions, or SHA) that actually represent a constellation of such abstract concepts as complex and that "although extremely brief, have immense utility to perceive the world." The idea is that the SHA, according to Flynn, "penetrated the cognitive repertoire of educated people, expanding their intellectual capabilities to become available in the form of cognitive units that can be used as elements of reasoning and debate." In other words, an economist, when he speaks of "market" or a biomedical specialist when he thinks of a "control group" or a statistician when he speaks of "random sample", knows very well that there's no need to lose time to reprocess these concepts each time you use them. By Friday evening 115 people, scientists from various fields of knowledge, had already responded to the challenge. Some answers are extensive and very complex. Others do not respond exactly the question. But there are, as always, approaches to suit all tastes and most are interesting enough to make it worth going to have a look.